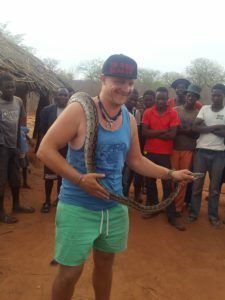 Paul Teasdale is the founder of a Non-Profit Reptile conservation program called Zimbabwe Snake Handlers. Paul has been passionate about reptiles since he was very young and has always gone out of his way to spread awareness about the importance of all animals in the ecosystem. He has been doing snake removal services in his hometown of Bulawayo for many years free of charge. At the age of 11 Paul started posting flyers around town and on vehicles offering this unique service. He quickly started receiving phone calls and, needless to say, many people were surprised when an 11 year old being driven by his mother showed up at the scene ready to “wrangle”. 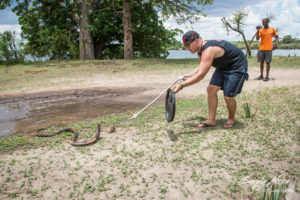 Please have a look at the Zimbabwe Snake Handlers Facebook Page and show your support for this unique type of conservation work that often gets overlooked.